It is surprising how many golfers do not properly understand the concept of nearest point of relief. You cannot play many rounds of golf without having to determine the nearest point of relief, e.g. when taking relief from any immovable obstruction, ground under repair, casual water or staked trees where a Local Rule mandates taking relief from them. I have covered several aspects of determining nearest point of relief in previous blogs and will now take this opportunity to remind readers that if you have any question on the Rules, one of the best ways of finding an answer, together with the appropriate reference to the Rule or Decision number, is to use the ‘Search This Blog’ facility at the top right corner of every one of my blog pages. So, if you enter the words “Nearest Point of Relief” you will receive many relevant links to my blogs, the fourth of which is titled ‘The Rule of Golf that is broken most often…‘, which also links to my short video on this same subject. I have now authored over 400 blogs, covering most Rules scenarios and this search feature is a great way to check any ruling that you may not have been sure of during a round. This recently received question relates to an interesting point on nearest point of relief, which I don’t think that I have blogged about previously. The answer to this question is, ‘Yes’ if the point on the other side of the drain is the nearest point of relief. In fact, the player must use this point to determine the permitted area where they may drop their ball, which is within one club-length of that point not nearer the hole. The reason for this being the nearest point is that there is no mental relief from an immovable obstruction in the Rules of Golf; so just because the narrow gravel strip lies between the toes of the player’s normal stance and where their ball would be positioned if they were using the club with which they would normally use for a reasonable stroke from that place, does not mean that they may drop on the near side of the immovable obstruction. 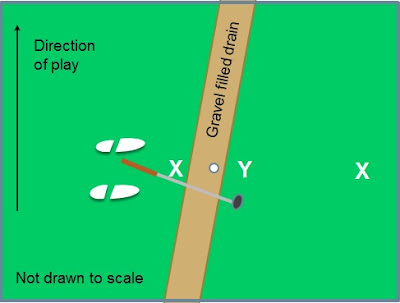 In the diagram above, which is not quite the same as in the question, the nearest point of relief for the ball in the gravel drain for a right-handed player is at point Y (for yes) and not at either of the two points marked X (for wrong). Note that the player’s stance for the wrong point X on the left side of the drain would be further away than in the diagram, which represents the player’s stance for the correct nearest point of relief. Of course, once the nearest point of relief has been determined the player may then drop their ball anywhere within one-club-length of that point, not nearer the hole, using the longest club they carry, which may be back on the near side of the gravel path. Please remember that there is only one nearest point of relief, except in the comparatively rare occurrence when ball lies in a position where there could be two equidistant points, and in most situations that point will be at a different place for left and right-handed players. Also remember that the nearest point of relief does not necessarily mean that the player will be able to drop in a more favourable position; sometimes it is better to play a stroke, even though there is interference, rather than taking relief in a less favourable position by taking the correct relief under the Rules. The Committee may make a Local Rule stating that the player must determine the nearest point of relief without crossing over, through or under the obstruction. Personally, I do not know of any course where this Local Rule has been introduced, but if your ball is on the ‘wrong side’ of a wall, fence, or something similar, you should definitely check the Local Rules before determining your nearest point of relief. I want to take this opportunity to thank those of you that email me to say how much you gain from the various content on the Rules that I supply through my blogs, free weekly ‘Rhodes Rules School’ emails and other eBooks and eDocuments that I sell (at very affordable prices!) from my Rhodes Rules School web site. If you haven’t already, please check out my two ‘999 Questions on the Rules of Golf’ eBooks at this link. Others have found them very helpful in improving their understanding of the Rules of Golf. 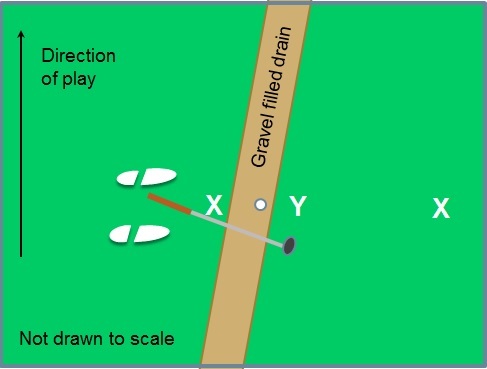 I don't think you are correct when you say "If the gravel filled drain in the diagram was a wire fence, or even a wall, the nearest point of relief would still be at the same place". A fence or wall would interfere with the player's swing if he stood on one side to play a ball on the other. In such a case the 'X' on the left of the fence would be the NPOR unless the local rule was in place in which case it might be the 'X' on the right (if the ball was on the right of the obstruction). Of course, what was I thinking! I have now made the correction. Golfer takes relief at y and drops within 1 club. 2. if the golfer then plays his shot with part of his foot touching the gravel, is that a penalty for taking incomplete relief? Barry, thanks for easing my concern regarding this issue. didn't know such a golf rule existed. Assume the player prefers to drop on the right side of the drain (better line to the hole or something). He measures one club length to the right of Y and drops. The ball strikes the course at a spot that gives complete relief, but then rolls a little closer to the drain. Now when he takes his stance, his heals are on the drain. I thought that since the drop didn't give complete relief that he would have to re-drop using Y as the NPR. But I read the rule and decisions and now I'm not sure. Would he drop establishing a new NPR or re-drop using the old NPR? 2. Yes, if the player chooses to take relief without penalty they must then take complete relief from the interference. 3. I can allay your fear! The interference, which is obviously at ground level, does not interfere with the lie of the ball, the player's stance or the area of their intended swing. This is an important point. Having determined the NPR at point Y, the player may then choose to drop within the one club-length permitted on either side of the drain, but this presumes that there is a point where they can drop their ball where they will get complete relief from the interference. If the ball rolls to a position where there is still interference from the drain (to the player's stance in your scenario) the ball must be re-dropped. If the same thing happens on the re-drop the player must then place their ball where it first touched the course after the drop, presuming that this point does give complete relief from the interference. There is only one nearest point of relief and the drop must be made using that as the reference point. Barry, tks for your reply to Golfer takes relief at y and drops within 1 club. If the golfer takes relief as appropriate as above at y, and contacts the path or GUR on his back swing or follow thru, is that then considered taking incomplete relief and thus a penalty? Yes, the player must take complete relief when taking relief without penalty. So, the player must re-drop the ball in the permitted area; if the ball again rolls to a position where complete relief has not been taken they must then place their ball at the spot where the ball first hit the ground after being dropped, assuming that they made their drop at a point where complete relief did exist. Yes, I can confirm that a player may drop anywhere within one club-length of the NPR, providing it is a valid drop and does not come to rest in a place where there is still interference from the condition that relief is being taken from. If a ball was dropped outside the shaded quartiles in Decision 25-1b/2, it is likely that the ball would come to rest nearer to the hole, or the player's stance would still be in GUR.